To help cut the chill of a lovely spring evening or the monotony of an air conditioned office, nona recommends that you Tie One On. These fun and versatile wraps are designed for the woman on the go -- giving you a light and stylish layer that stays put. 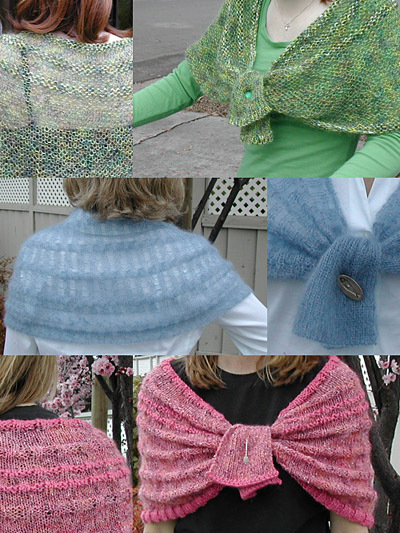 All 3 variations are based on the same shape, simply changing the yarn or stitch pattern gives you a variety of looks. Regardless of your age, shape, or knitting skills there's a variation for you; the green is mellow, the pink is tangy and the blue is piquant. nona wonders, How will you Tie One On? 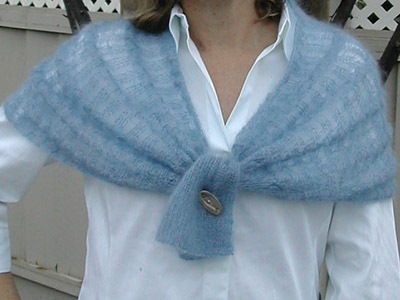 First the wrap's body is knit from the hem to the neck. The body is 16 inches in length and gradually narrows in width from 40 inches to 26 inches. Once the body is completed, stitches are picked up on each side of the body and the wrap's ties are knit in 1x1 rib. The ribbed ties are narrower than the length of the body, causing the wrap to scrunch in at the edges. When picking up stitches, it is important to evenly space the new stitches along the edge. To help with this, use safety pins to divide each edge into 4 equal sections, then pick up approximately one quarter of the required sts in each section. The 24-row Stripe Pattern is worked in garter stitch, beg with a RS row. Rows 1-4: Work with MC and CC held together. Rows 5-10: Work with MC only. Rows 11-14: Work with MC and CC held together. Rows 15-20: Work with MC only. Rows 21-24: Work with MC and CC held together. Row 1 [RS]: [K2, p3] to last 2 sts, k2. Row 2 [WS]: [P2, k3] to last 2 sts, p2. Row 2 [RS]: K2, [yo, k2] to end. Row 3 [WS]: P all sts. Row 4 [RS]: K2, [drop 1 st off left needle, yo, k2] to end. Row 5 [WS]: Purl all sts. Repeat Rows 4 and 5 three more times. Next Row [RS]: K2, [drop st off left needle, CO 3 sts onto right needle, k2] to end. Using larger needles, with MC and CC held tog, CO 120 sts. Beg with a WS row, work in garter st for 5 rows. Use a safety pin to mark the RS of the work. Switch to MC only and continue in garter st until body measures 3 inches, ending with a WS row. Next Row [RS]: Dec 5 sts evenly spaced as foll: k11, k2tog, [k22, k2tog] 4 times, k11. 115 sts rem. Work until body measures 6 inches, ending with a WS row. Next Row [RS]: Dec 6 sts evenly spaced as foll: k9, k2tog, [k17, k2tog] 5 times, k9. 109 sts rem. Work until body measures 8 inches, ending with a WS row. Next Row [RS]: Dec 6 sts evenly spaced as foll: k9, k2tog, [k16, k2tog] 5 times, k8. 103 sts rem. Work until body measures 10 inches, ending with a WS row. Next Row [RS]: Dec 8 sts evenly spaced as foll: k8, k2tog, [k10, k2tog] 7 times, k9. 95 sts rem. Work until body measures 11 inches, ending with a WS row. Next Row [RS]: Beg 24 row Stripe Pattern described above and cont in this patt for the rest of the body. Work until body measures 12 inches, ending with a WS row. Next Row [RS]: Dec 8 sts evenly spaced as foll: k8, k2tog, [k9, k2tog] 7 times, k8. 87 sts rem. Work until body measures 14 inches, ending with a WS row. Next Row [RS]: Dec 8 sts evenly spaced as foll: k8, k2tog, [k8, k2tog] 7 times, k7. 79 sts rem. Cont until all 24 rows of the Stripe Pattern have been worked. BO all sts loosely. With RS facing, MC yarn, and using larger needles, pick up and k 39 sts evenly spaced along one of the side edges. Next Row [WS]: P all sts. Next Row [RS]: [K1, k2tog] 13 times. 26 sts rem. Next Row [WS]: Using smaller needles, work in 1x1 Rib. Cont in 1x1 Rib until tie measures approx. 7.5 inches, ending with a WS row. Next Row [RS]: With MC and CC held tog, work in 1x1 rib. Work 2 more rows with MC and CC held tog. BO all sts. Work second tie on other side edge of wrap. Using larger needles and CC, CO 187 sts. Beg with a RS row, work 4 rows in 2x3 rib. Change to MC and work 9 rows in St st, ending with a RS row. Next Row [WS]: Dec 10 sts evenly spaced as foll: p11, p2tog, *p16, p2tog* 9 times, p12. 177 sts rem. Work 4 rows in 2x3 rib, foll by 9 rows in St st, ending with a RS row. Next Row [WS]: Dec 10 sts evenly spaced as foll: p11, p2tog, [p15, p2tog] 9 times, p11. 167 sts rem. Next Row [WS]: Dec 15 sts evenly spaced as foll: p5, p2tog, [p9, p2tog] 14 times, p6. 152 sts rem. Next Row [WS]: Dec 15 sts evenly spaced as foll: p5, p2tog, [p8, p2tog] 14 times, p5. 137 sts rem. Work 4 rows in 2x3 rib, foll by 6 rows in St st, ending with a WS row. Change to CC and work 2 rows in 2x3 rib. Change to MC and work 3 rows in St st, ending with a RS row. Next Row [WS]: Dec 15 sts evenly spaced as foll: p4, p2tog, [p7, p2tog] 14 times, p5. 122 sts rem. Change to MC and work 6 rows in St st, foll by 4 rows in 2x3 rib, ending with a WS row. Next Row [RS]: Dec 15 sts evenly spaced as foll: k4, k2tog, [k6, k2tog] 14 times, k4. 107 sts rem. Work 9 rows in St st.
Change to CC and work 3 rows in 2x3 rib. BO all sts loosely in 2x3 rib. With RS facing, MC yarn, and larger needles, pick up 60 sts evenly spaced along one of the side edges. Next Row [RS]: [K1, k2tog] 20 times. 40 sts rem. Next Row [WS]: Using smaller needles [k2, p1, k1, p1] to end. Next Row [RS]: [K1, p1, k1, p2tog] 8 times. 32 sts rem. Cont in 1x1 rib until tie measures approx 7.5 inches. Change to CC and work 1 row in 1x1 rib. BO all sts in patt. Using larger needles, CO 252 sts. Beg with a WS row, work 4 rows in 2x3 rib. Rows 1-12: Work 12 rows of Drop Stitch Pattern. Rows 13-15: Work in 2x3 Rib. Row 16: Work decrease row as instructed below. When working decrease rows, work in 2x3 Rib as set, working decreases as k2tog or p2tog as necessary to maintain pattern. First decrease row: Dec 15 sts evenly spaced as foll: rib 13, dec 1, [rib 14, dec 1] 14 times, rib 13. 237 sts rem. Second decrease row: Dec 20 sts evenly spaced as foll: rib 13, dec 1, [rib 9, dec 1] 19 times, rib 13. 217 sts rem. Third decrease row: Dec 20 sts evenly spaced as foll: rib 12, dec 1, [rib 8, dec 1] 19 times, rib 13. 197 sts rem. Fourth decrease row: Dec 20 sts evenly spaced as foll: rib 12, dec 1, [rib 7, dec 1] 19 times, rib 12. 177 sts rem. Fifth decrease row: Dec 20 sts evenly spaced as foll: rib 12, dec 1, [rib 6, dec 1] 19 times, rib 11. 157 sts rem. Sixth decrease row: Dec 20 sts evenly spaced as foll: rib 11, dec 1, [rib 5, dec 1] 19 times, rib 11. 137 sts rem. BO all sts. loosely in patt. With RS facing, and larger needles, pick up 81 sts evenly spaced along one of the side edges. Next Row [RS]: [K1, k2tog] 27 times. 54 sts rem. 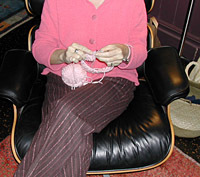 Next Row [WS]: Using smaller needles [k1, p1] twice, [k2, p1, k1, p1] to end. Next Row [RS]: [K1, p1, k1, p2tog] to last 4 sts, [k1, p1] twice. 44 sts rem. Cont in 1x1 rib until tie measures approx 8 inches. BO all sts in patt. 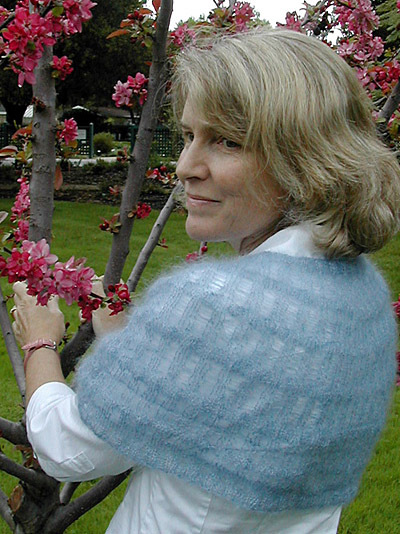 nona learned to knit about 12 years ago when she had many hours of idle time spent in the park with her 2 sons. 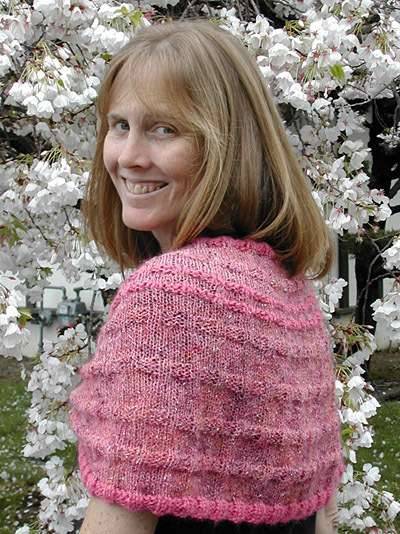 nona believes you don't have to be a "natural knitter" who has been knitting since childhood to be a good knitter. It just takes practice, experimentation, and a good sense of humor. 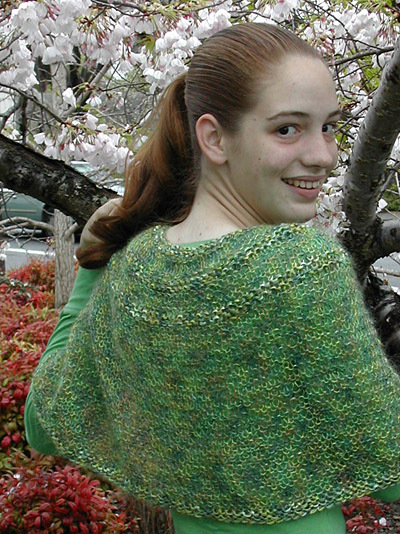 You can following nona's knitting shenanigans at her blog -- and remember, "If nonaKnits, then you can too".